The groundbreaking Rezenerate NanoFacial is a non-invasive modality designed to restore youthfulness and radiate your skin! Drastically reduces fine lines and leaves your skin feeling and looking younger. Utilizing cutting-edge Nanotechnology is so safe and delicate; you can go directly to the lash line under the eye area and lip area giving an instant healthy pump and fullness. NanoFacial delivers unparalleled results! it provides an immediate plumpness while also allowing for greater absorption of the nutrients such as, antioxidants, plant stem cells and peptides that are introduced into the skin during the treatment. This treatment is customized for each client for their specific indications and is totally relaxing. This fabulous choice for someone who wants a truly corrective treatment without any downtime! 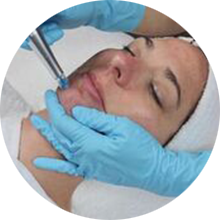 Other options are available for maximum results such as, Microdermabrasion, Peel (light peel) Dermafile, Ultrasonic and Microcurrent. Any of these additions or combination only maximize results. The Rezenerate Wand is a professional-grade, state-of-the-art precision cosmetic tool featuring nano-technology designed to address fine lines and wrinkles, blemishes as well as a myriad of other cosmetic skin issues. Rezenerate NanoFacial uses 3-phase process that is centered around gentle "stratum Disruption"